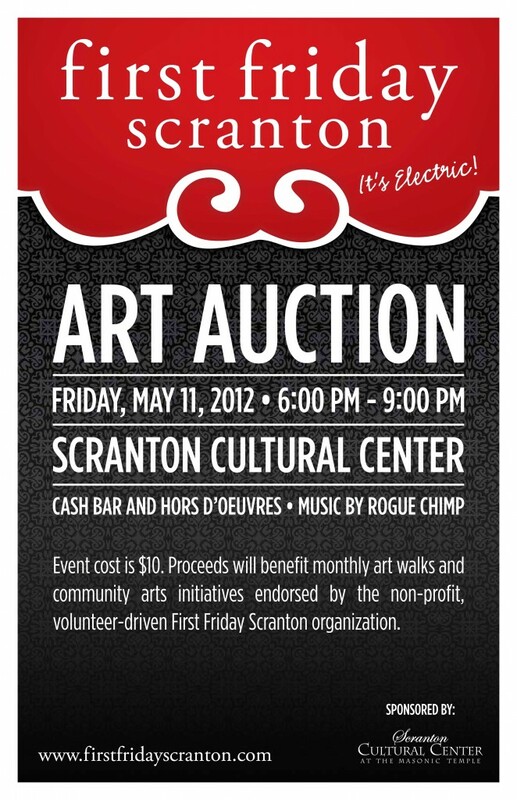 First Friday + Scranton Cultural Center + Local Artists & Businesses = 3rd Annual Art Auction! The time is upon us. Its been a few months in the making: the submissions have been finalized, the band is tuned and the venue is set. This Friday, starting at 6pm with performances by Rogue Chimp, the 3rd Annual First Friday Art Auction will begin in the Scranton Cultural Center. Tickets can be purchased at the door for $10. This has been a banner year for First Friday, with a number of generous artists and local business contributing to the non-profit organization’s yearly benefit (wine, gift certificates and more!). For more information about the event, or to read about the artists that will be featured in the auction, please visit the First Friday’s website. Hope to see you there!